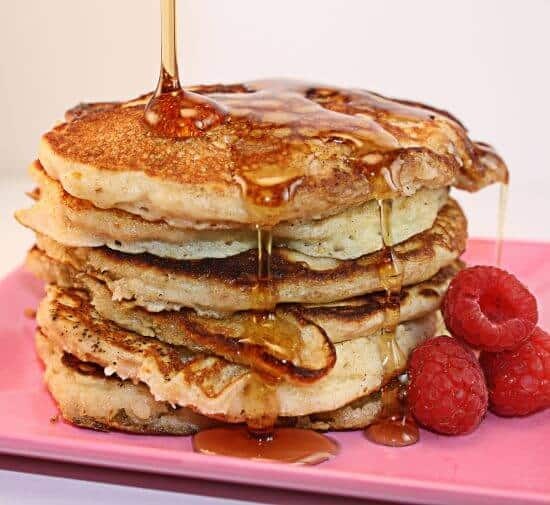 These easy oatmeal pancakes have been made countless times and everyone always loves them. One of my most popular recipes! My mom is the best cook in the world and these easy oatmeal pancakes prove it. It doesn’t matter how great the dish is that I’ve made on any particular day, nothing can ever compete with mom’s home cookin’. This is just another testament to the way that food brings us all together. Bobby Flay can challenge my mom to a throwdown any day, but if I’m one of the judges, just a bite of anything my mom made is going to catapult her dish to the top, hands down. Tastes translate into memories for me, and my mom created a lot of great ones! I’ll admit to being sentimental about these easy oatmeal pancakes. I don’t recall exactly when she started making them, but like any great tradition, it started with one pancake and grew upon request after request, until one day these easy oatmeal pancakes were just a part of life when Nana came to town. Every one of her grandkids scramble for a seat at the table as soon as the first pancake hits a plate, and Nana doesn’t stop making them until we’ve all had a good six or so – each! 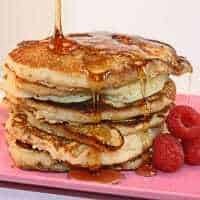 I actually refused to make these easy oatmeal pancakes for my girls for a long time, simply because this was a memory that belonged to my mom; it was that special something that she did for them. I’ve relented since then, only because they’re just so delicious that even I can’t wait until she visits for more! I really hope you try them; they’re so delicious and light, with a different texture from regular pancakes. You won’t even notice the oatmeal (don’t worry, these don’t taste like “healthy” pancakes – they’re just good)! 1 1/2 cups buttermilk, don’t substitute, it won’t be the same! I love the oatmeal involved! They look great! Wow, I love this idea. I'm with you: Mom's cooking is always the best. Can't wait to try these. Too HOT to cook this week though. 107 in Seattle today! Thanks for the recipe.What type oatmeal did you use?Would quick cooking oats work? I would love to try these delicious looking pancakes! Never had pancakes with oatmeal yet. I love your picture! Oh YUM! I have a recipe for this from The White Gull Inn in Door County, Wisconsin. Theirs has you making the batter at night and "marinating" it in the fridge til morning – which I have to say is convenient. Beside the apple baked-in-the-oven German pancakes I make, this oatmeal one is hands down the best! I'm really using oatmeal a LOT. Would you happen to have an oatmeal muffin recipe? I tried this recipe – this morning for breakfast.It was delicious!! (Notice- I say "was" ,as it is all gone).My 15month son gobbled it,in an instant,as did my husband and I. This is definitely one that I will making often. Amy!! That's so awesome that you guys liked it so much. I love, love, love them so it's fun when other people do, too! Suzen…your German pancakes sound awesome! You know I grew up in WI, right? Here's a link to a bunch of muffin recipes, all of which use oatmeal! Let me know if you make any of them and how they turn out! Thanks so much! I just made these this morning before church and everyone loved them! Even my very picky husband, who usually doesn't like the oatmeal pancake recipe I've used in the past, approved of these and had seconds. Thank you!!!!! Made these for the first day of school – my boys loved them!!! Thanks so much for a great recipe! This is the best pancake recipe EVER….seriously! Found the receipe less than a month ago and have been making almost every weekend. Have tried with all different types of fruit, banana, strawberries, pineapple, cherries….and the fave so far was cherries oddly enough. Today made it with choc chips and of course it was well received. Next week I want to try apple or blueberries. Thanks soooo much! Oatmeal pancakes are THE BEST, you are so right. We make them with leftover oatmeal from earlier in the week (two breakfasts, one stone, or something like that). And although my brain tells me oatmeal should make pancakes heavy and stodgy, they are some of the lightest and most tender, anywhere. Mmmm. Thanks for the reminder. Molly! Thanks for the nice comment. It had never occurred to me to use leftover oatmeal – what a great tip! Thanks! These look great! I feel like this is a silly question after all these comments but do you cook the oats before adding them to the batter? or throw them in dry? I will definitely show my mom your comments and I know it will make her very happy. Food is all about sharing and making memories; it's the highest compliment that other families might now make these pancakes their tradition, too. I don’t believe I’ve ever had an oatmeal pancake, but I sure do want one now! Great recipe and it was sweet reading about your love for your mom’s cooking. Thanks, Brandie! I’d never had one until my mom started making them, either! They’re sooo good though. A little more crispy around the outside and even more filling than regular pancakes. Thanks for the comment! Thank you for the recipe, it was great, just found you on pinterest and thought it was interesting the idea of oatmeal pancakes. This is going to be are recipe for panckes now. I do like it better if I let it rest in the fridge for a couple of hours, made them for my husband this morning at 4 am and it was just to early for me but then left the rest of the batter for later for me and our girls and it was even fluffier after sitting a couple of hours. Thank your mom too for a great recipe. I’m so thrilled you love it so much, Lorena! Thanks for the great tip on letting it rest; I’ll have to give that a shot. Thanks for sharing! I recently bought the Williams-Sonoma oatmeal pancake mix and my kids loved them but it’s expensive! I can’t wait to try your recipe. I have a question though, what kind of oatmeal do you use – old fashion, instant, etc? Thanks!! Hi Gaby! You can just use the quick-oats. I buy the big “tube” of Quaker Oats and it works great. But any brand will do. Happy New Year! I just stumbled upon this recipe via a web search. I wanted a pancake that was a bit lighter than what you normally make. This is the BEST recipe for homemade pancakes EVER! The oatmeal in the batter makes them so light, so delicious!!!!! My hat is off to Nana! GREAT RECIPE!!! I love these pancakes and make them often. Thank you! I know you say not to sub buttermilk, but i don’t usually have buttermilk on hand, so I use vinegar to sour the milk & I think they turn out delicious!! Today I really felt like banana pancakes, so I subbed 1 cup mashed bananas for 1 cup of the milk & they turned out SO yummy!! Thought i’d pass that on. Thanks again for the recipe! Oh! And i usually use whole wheat white pastry flour instead of all purpose. Your moms recipe is most worthy of writing my first post ever. It was light, flavorful with the added bonus of a health boost with the oatmeal. My finicky teenage boy ate them without a complaint. Thank you for sharing such a great recipe that has filled your heart over the years. The only adjustments that I made were : chopping the oatmeal in one recipe and grinding the oatmeal to a flour consistency in another recipe. My husband preferred the flour batch. Thanks again! Great idea to grind the oatmeal! I’m okay with it as long as it sits awhile to soften the oatmeal but I can see how grinding it would work really well. I’m obsessed with my Vitamix and I may just grind some up to keep on hand. Thanks, Marie! Oh my goodness, this is my new favorite pancake recipe! I’m usually a good cook, but pancakes are the one thing I can never get right–I’ve been getting so frustrated and keep swearing I’ll never make pancakes again– but these ones were perfect! They were so flavorful and cooked up so well. This will definitely be my go-to recipe from now on; thank you so much for sharing it! That makes me so happy, April!! The kids are a little older in our family now; my mom doesn’t make these as often so it’s a real treat when she does. They really are good, right?! I’m not a huge pancake eater but I can put these down in no time :) Thank you so much for the lovely comment. Cheers! Thank you for the easy recipe! Add 1tsp. Cinnamon and 1/2 cup raisins and you have oatmeal cookie pancakes. That was our breakfast and my kids LOVED it! Ohhhh…love those additions! So happy you enjoyed these. Thanks, Tina!